With Ice Age: Dawn of the Dinosaurs hitting theaters this weekend, we have a good example of a film that may play fast and loose with reality, but nonetheless serves to inspire kids to think about science. 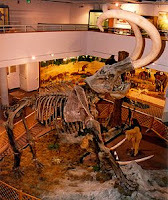 Last we checked, no reputable scholar believes that the Woolly Mammoth and the T-Rex occupied the same homestead. In fact, they missed each other to the tune of more than 60 million years. The first Tyrannosaurus likely terrorized its first Duck-Bill about 70 million years ago. Saber-Toothed cats came on the scene about 40 million years later – though excavations at the La Brea Tar Pits have revealed that big cats lived on the strip where The Walk of Fame resides today, so Saber-Tooths in Hollywood actually do have factual underpinnings. There may be little actual accurate science in the premise of Ice Age: Dawn of the Dinosaurs, however, in personifying these ancient creatures with identifiable characters, parents and children can start a rare fun and educational discussion. Is it possible that some Jurassic Dinosaurs might have survived long enough to share wacky misadventures with Saber-Toothed cats and Mammoths? Um, probably not – though it’s fun to imagine what that might have looked like. And why not turn an entertaining summer movie into a conversation starter? Maybe swinging by the La Brea Tar Pits or your local Natural History Museum on the way home from the theater could start a life-long passion in a little one close to you.